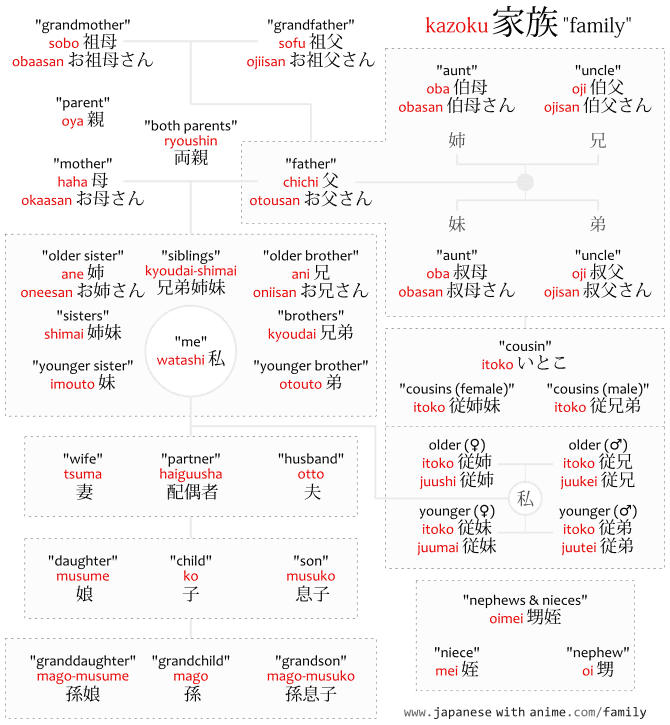 For reference, a list of words for family members in Japanese. Kanji can be read different ways. This is why chichi 父 and otousan お父さん are written like that. Furthermore, one same word can be written with different kanji. The term NG as seen in the titles of many referenced articles stands for "not good" and means you shouldn't use or say something. When "family" refers to one's "household," the term katei 家庭 is used instead. This would be used in cases like "familial" matters, something that happened inside the family. That is: kazoku is a family as a structure, kinship, while katei is domestic, related to home. One phrase common in anime is katei jijou 家庭事情, "familial circumstances," usually used when a characters parents want him to move from one school to another or something like that. This is because a kakei 家系 is the "lineage of a family," while a zu 図 is a "diagram." Note: a "father" as in a "priest" of the Catholic church, etc. is shinpu 神父 in Japanese. The terms goshisoku and goreisoku are more formal and may be considered too formal to use normally, specially goreisoku. The terms goshijo, gosokujo and goreijo are formal, and sometimes considered too formal to be used normally, specially goreijou. Single parent. One of the two parents. The terms above may all be used to say "parents" in Japanese. The term goryoushin ご両親, with the go ご honorific, is used to refer to the parents of other people, not your parents, only of other people. The word kodomo 子供 may refer to someone's "children" in plural, __ no kodomo 〇〇の子供. But it may also refer to "children" as in "they're young." The following terms are used when when talking about parent and child at the same time. In Japanese, there are terms for sons and daughters based their birth order, which are used instead of phrases like "first son," "oldest son," "first daughter," etc. we'd use in English. Normally, the children are counted using numbers and counters. You may have noticed the terms jinan 次男 and jijo 次女 are not written with the kanji for "two," ni 二, and not read ninan and nijo either. This happens because they second son and daughter are the "next" (after the first) son and daughter, so they're written with the kanji for "next," tsugi 次. They may be written with 二 too, but they'd still be read jinan and jijo. There are synonyms for "first-born" that use the kanji for the word "long," nagai 長い, because they've been born for the longest time, they're older, the eldest. For the record: the chounan is the chounan forever. The jinan never becomes chounan, not even if the chounan dies and the jinan surpasses him in (living) age. The same applies to the other words. The terms for the "youngest" child in Japanese used the kanji for the word "end," matsu 末, as they're the last children born and consequently at the end of the offspring list. In some cases, parents may name their sons following a certain custom of adding a suffix according to their birth order. In which case, the name of a person (or anime character) hints whether they're the youngest or have an older brother, etc. For example, in Uchouten Kazoku, the name of the sons of main character's family are: Yaichirou, Yajirou, Yasaburou, and Yashirou. This practice is called haikoumei 輩行名. The word shujin originates from the "lord," aruji 主, of a home, implying the husband, in which case everyone else in that same home serves the lord, the man of the house. Although most people don't really care the term's origins, some of the working women in modern society may be against its usage, as the word seems rather sexist. It always means husband, never wife, implying you can assume the lord of the house is male. The term onnashujin 女主人 exists for female shujin, but that word is not used to say "wife." The term goshujin, with the honorific prefix go 御, would refer to other people's husbands, as it's unusual to use honorifics toward yourself. You don't need to use honorific suffixes (san, sama) with this word. In anime, the term goshujinsama often refers to a maid's "master," in other words, the lord of the house where the maid serves. It's also used in similar fashion in other contexts. The dan'na words are often used more casually than shujin. Besides meaning "husband," the word dan'na may also refer to the master of a house, like shujin, and sometimes it can also refer to the master (owner) of a shop, so long as he is a man. Besides that, dan'na 旦那, written as dan'na 檀那, means "(male) patron," and it's used to refer to male customers of shops. This is similar to how the word "boss" is sometimes used in English to refer to customers, as they're the ones giving the orders. Besides that, too, the origin of dan'na 旦那 lies in the word daana ダーナ, loaned from Sanskrit, where it would mean "donation." Basically donation means patron means customers means "boss" means master of the shop means master of the house means husband. Sometimes, words that would usually mean "father" can be used to refer to one's husband. Note that anata is only used when talking to the husband. There's no such thing as "my anata" meaning my "husband." Originally, yome referred to the bride of your son, but nowadays it's also used to refer to your own bride, or your own wife too. The term okusama is normally used to refer to other people's wives, not yours. Although some people use it to refer to their own wife. Sometimes, words that would usually mean "mother" can be used to refer to one's wife. The following words have the "artificial," gi 義, prefix and have other uses (like adoptive relatives, etc.). But they can be used to refer to in-laws too. To say brother in Japanese there are different words depending on whether they're your older brother or younger brother. The term otoutosan 弟さん is used when talking about the otouto of someone else. To say sister in Japanese there are different words depending on whether they're your older sister or your younger sister. Th term imoutosan 妹さん is used when talking about the imouto of someone else. The words for siblings in Japanese are written with the kanji of the words for brothers and sisters. Sometimes, the word kyoudai may be written with different kanji depending on the gender of the siblings, as a gikun, even though the words keimai, shitei and shimai exist. Sometimes the words above are written with another kanji, for example ojiisan お爺さん. This is usually a way to refer to just any "old man" rather than anyone's actual grandfather. Just like "grandpa" is sometimes used toward elders in English. When written as obaasan お婆さん, the word refers to a "old woman" familial relationship. The same as "grandma" is used in English. To say uncle in Japanese, when calling some random old man "uncle" colloquially even though you're not related at all: ojisan 小父さん. The word obasan 小母さん may be used colloquially to refer to random old women, family or not. Just use itoko いとこ or check 従兄弟, 従姉妹, 従兄, 従弟, 従姉, 従妹 for the differences. The いとこ part may be written with kanji following the same rules as the word itoko いとこ, "cousin." The word hatoko is a jukujikun 熟字訓 that somehow managed to be written with 3 kana (はとこ) but 4 kanji (再従兄弟). Very exceptional. Anyway, it works the same as its synonyms. You can change the 従兄弟 part in 再従兄弟 depending on the second cousin. In other words: kyoudai-shimai no kodomo 兄弟姉妹の子供, "children of your brothers and sisters." To adopt (a child, not an idea, attitude, etc.). Generally speaking, jitsu 実, "real," implies someone is related by blood, while gi 義 and giri 義理 implies they are not related by blood. Younger sister related by blood. Biological younger sister. Older brother related by blood. Biological older brother. By the way, chi no tsunagari 血の繋がり, literally "connection of blood," refers to blood relationships. These words all refer to the same thing regardless of suffix. That is: oniisan, oniisama, and oniichan all mean "older brother." Likewise, oneesan, oneesama, and oneechan all mean "older sister." The difference between them is in nuance. The san suffix may be regarded as neutral. The sama suffix is more formal, traditional, respectful, and puts a distance between the speaker and the person they're referring to. Meanwhile, the chan suffix is less formal, and more intimate, friendly, chummy instead, implying closeness between the speaker and whom they're referring to. In anime, the suffix used may hint the relationship between the characters and show an aspect of their family. For example: when calling fathers, mothers, older siblings with sama, it implies respect. This may mean the family places importance in tradition. Like a rich family where children are educated to say "father," and not just "dad," as that may sound ridiculous if heard by others. In some cases, an older brother or sister being called with sama implies the younger sibling has excessive admiration for them. On the other side, using chan implies it's a cozier family where rigid norms don't really matter. Toward parents, it may imply a good relationship with them. Or it may imply it's a poor family. Or one from the countryside. Referring to siblings with chan implies the closeness likewise. Sometimes this is done mockingly. There's no difference between these words in meaning. Both chichi and otousan mean "father." Both haha and okaasan mean "mother." The difference between chichi and otousan, haha and okaasan, etc. is in how they are used. Basically, it follows the golden rule that you don't use honorifics toward yourself, except on a familial level instead. The versions with honorifics, otousan, okaasan, etc. are used only when talking to someone inside the family, "relatives," miuchi 身内, while the versions without honorifics, chichi, haha, etc. are used outside the family, "other people," tanin 他人. Following that, if you're talking about someone else's relatives, you may use honorifics too. This means that, when one character is talking to someone they are not related to, chichi refers to their father, while otousan refers to the father of whom they're talking to. Note that to some people mistaking the usage described above makes you look like you weren't properly taught how to use the words. Also note that some people do mistake how the words are used. And some people do not mind how they are used. So it's a really tricky set of words. Some children use the terms papa and mama instead of otousan and okaasan to refer to their own parents. You might imagine this would only be a trivial fraction of all children, as papa and mama are obviously western words, surely otouchan and okaachan or something more Japanese-sounding would be more adequate? However, a good portion of the families (39.8% according to the referenced data) have their children use papa and mama inside the family, when not talking to people outside the family. Note that the word mama まま also means "the way something is." The terms chichioya and hahaoya differ from haha and chichi in the way they're used. When you use chichi and haha, you're talking about what a person, who happens to be a father or a mother, is doing. That is, it's merely a way to refer to them, to describe them. You can replace these words by their names every time and the phrase would still make sense. "Mother went to X," for example. Meanwhile, chichioya and hahaoya refer to parents as parents, acting in their capacity as parents. They can be used, for example, to speak generally: "a mother would do this," or, "mothers do this." Furthermore, there are cases where chichioya and hahaoya refer to one's parents, not parents in general. In this case, the terms are used because they feel more general, therefore more distant, and lack the intimate aspect of chichi and haha. In other words: chichi and haha sound too casual when compared to chichioya and hahaoya, so people use the oya words instead in situations they want to avoid sounding too cozy. The terms oyaji and ofukuro mean "father" and "mother" respectively. They're used mostly by men, not by women. In anime, characters calling their fathers oyaji are common. Some of them have a rebel personality, making the term oyaji sound like a disrespectful word. In fact, some people in real life think the term is impolite. That isn't necessarily true. Sure, these terms aren't exactly full of reverence, however, they're often simply the way people end up calling their parents. It doesn't imply they respect them less or more. It can imply they have a closer relationship, maybe, but it would be wrong to assume someone who says oyaji is in bad terms with their father. Sometimes, suffixes are added to the words: oyajisan 親父さん, ofukurosan お袋さん. The contraction oyassan おやっさん also exists. There are some Japanese terms for family members that end in ue 上. They're simply the non-ue version with ue added to it. The words above infer reverence, as ue 上 means above. So they're generally used toward seniors. The words for son, daughter and younger brother, younger sister do not have ue 上 versions. The difference between chichi and chichiue, haha and hahaue, etc. is in how they're used. There's no difference in meaning. Both chichi and chichiue mean "father," and so on. The words with ue, chichiue, hahaue, aniue, aneue, are not used in modern times. They were more common in the Meiji era (before 1912). Nowadays chichi and the other non-ue words are used more instead. So if you have to choose, choose the words without ue. In writing, the ue words may still be used, just not in speech. Also note that some families still prefer to use the ue words instead, but that's just some particular cases and not the general situation. In anime, fiction, etc., specially theater pieces, the usage of chichiue, hahaue, aniue, aneue indicates the character comes from a very traditional family, or that they're somehow anachronistic. Like they time-traveled to or from the Meiji era or something. The words fukun, also read chichigimi, and hahagimi, are ways to refer with reverence to a father and a mother. These words are like chichiue and hahaue: they're rather old, they aren't used much in speech, and they are found more in writing. One difference, however, is that chichiue and hahaue are used to refer to your own parents, while chichigimi and hahagimi are used to refer to someone else's parents. The words chichigo and hahago are just like chichigimi and hahagimi, used to refer to other people's parents, mainly used in writing, except the terms feel a bit older-fashioned. The word chichigo is also read as tetego. The words sonpu and and goshinpu are mainly used to refer to the parents of whom you're talking. These are also words of reverence, and also used more in writing. The words faazaa, mazaa, shisutaa, and burazaa are katakanizations of the English words "mother," "father," "sister," and "brother." Although these words aren't really used in real life to refer to people's family, they're often seen in loaned words that make use of them, like "motherboard," for example. More often, these words refer to another type of relationship. For example, shisutaa can refer to a "nun," like "sister" sometimes does in English. In anime, there are cases where characters may call their family by these words but that's just anime being anime. The words aniki and aneki refer to a brother and a sister respectively. These words are like aniue and aneue, they refer to them with reverence, except they are still used in speech to this day. The reason for this is probably that aniki and aneki are sometimes used to refer not to one's real brother, but just to an older guy or girl whom they respect. That is: it's basically senpai, the "bro" version, and its female counterpart. In particular, in anime it's common for gang members to call their boss aniki, even if that boss is just a middle-management kinda boss and he has a bossier gang boss himself. Likewise, girl gangs would use aneki. The words anija and aneja are words used in the past to refer to the "older brother" and "older sister" respectively. They aren't used in modern speech, but you may see it in songs, anime, manga, etc. They're abbreviations of anijahito 兄者人 and anejahito 姉者人. Since these words infer reverence to whom they refer to, they exist only for the seniors, the older brother and older sister. Words such otoja 弟者, which would be the "younger brother" variant, probably did not exist when onija and oneja were in use,. Instead, it's possible they were made up in modern times. Remember: onija and oneja are still used in fiction, music, etc. today. So someone, knowing onija was a word, figured otoja would be a word too. The terms obocchan and ojousan are two separate words that have similar usage. They refer to someone else's son and daughter respectively, and they're used in reverence. The origin of obocchan seems to come from "Buddhist priests," bouzu 坊主. Because of their iconic crew cut hairstyle, the term "bouzu head," bouzu-atama 坊主頭, even came to mean that. And young boys, who had such hairstyle, ended up being called obocchan affectionately. This is why obocchan, with the affectionate chan, often refers to the son of someone, while obousan, with a simple san, rather refers to a Buddhist priest. The word ojousan, on the other hand, normally refers to someone's daughter, simply put. But it can be used in other ways too. For example, sometimes ojousan refers to a young woman whose name is unknown. Because the terms obocchan and ojousama refer to children but have honorifics, they've come to be associated with children of rich families. After all, among lesser enriched families people wouldn't waste time with such pleasantries. Since these terms are associated with rich children, it's sometimes the case of saying someone is an obocchan or ojousama mockingly if they appear to be from a rich family. In this case you aren't really saying "son" or "daughter," it's more like a slang that implies they're snobby, or have a different social position, tastes, etc. The terms ooji and ooba are used to refer to a grandfather and grandmother respectively. These terms come from oochichi 大父, literally "great father," and oohaha 大母, "great mother," respectively. The terms jiji, baba are used to refer to a grandfather and a grandmother respectively. The terms jii じい and jiiji じいじ are distortions of jiji じじ, while baaba ばあば is a distortion of baba ばば. These terms are usually associated with children, who eventually stop using these words and start saying something else when they grow up. This isn't always the case, however, as there are adults who use them too. Some people consider these terms a bit rude, believing ojiisan and obaasan should be used instead. Historically, Japan has a system where the one true heir of a given family is usually be the "oldest son," chounan 長男, the "first-born son," ichinan 一男. Since this heir would inherit everything of the family, the family business, firms, heirlooms, cursed swords with demons sealed inside, houses, properties, style of martial arts, assets, etc. the heir would probably have to stay home learning about his ancestry and the techniques that have been passed down his family line for generations. Meanwhile, the daughters and the younger sons would go away and get married off into other families. The easiest way to tell these apart is the surname, or family name. If your grandparent had to changed their family name to yours, they're from "outside" and entered the family. If your grandchild has a different surname than yours, they've left your family and gone "outside." Generally speaking, the child of your son is "inside" while the child of your daughter is "outside." An exception happens when a mukoyoushi 婿養子 is involved, which is a husband that takes the wife's family name. If your son is a mukoyoushi, he changed his family name, so his child is going to be "outside" your family. Conversely, if your daughter marries a mukoyoushi, she keeps your family name, so her child would be "inside" your family. The practice of calling heirs this way has fallen out of usage since World War II, probably because it became less relevant in modern times. Because of this, not everyone knows the words' original meanings. Instead, they'll assume a gaisofu always means the maternal grandfather, as it normally means that, even though there's a possibility that's not the case. For example, if your father is mukoyoushi, then gaisofu would be your paternal grandfather, because your mother kept her family name. Since you inherited the family name from your mother, you were born "inside" your mother's family, and "outside" your father's family. Consequently, your mother parents are "inside" and your father parents "outside." In Japanese, the words "uncle," oji, "aunt," oba, and their derivatives may be written with different kanji: 伯父 and 叔父 for oji, 伯母 and 叔母 for oba. The difference between 伯父 and 叔父 is that 伯父 is your "mother or father's older brother," fubo no ani 父母の兄, while 叔父 is your "mother or father's younger brother," fubo no otouto 父母の弟. Likewise, the difference between 伯母 and 叔母 is that 伯母 is your "mother or father's older sister," fubo no ane 父母の姉, while 叔母 is your "mother or father's younger sister," fubo no imouto 父母の妹. The truth is there aren't Japanese words for your "parent's younger brother" and for your "parent's older brother." There's only one single word for both cases: oji, your "parent's brother." The reason it gets written differently according to the seniority is because kanji were imported from China, and in the Chinese language (I guess) there's one word for the younger brother uncle and one word for the older brother uncle. So Chinese had four words while Japanese only has two, oji and oba. This mismatch is why there are extra ways to write the same Japanese word and those extra ways bear different meaning according to their Chinese origins. The word for cousin in Japanese, itoko いとこ, may be written with different kanji depending on what it refers to. One male cousin and his younger sister. One female cousin and her younger brother. Why Itoko Has So Many Kanji? The reason why the word itoko words this way is because in Chinese there are actually different words depending on the cousin and the kanji combinations stem from how those words are written in hanzi..